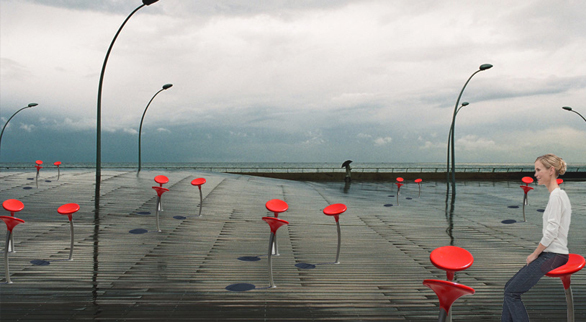 Finferlo is a chair with ischial support and a colored, rounded and captivating shape that comes to the rescue of the different demands of people in urban and extra-urban routes. 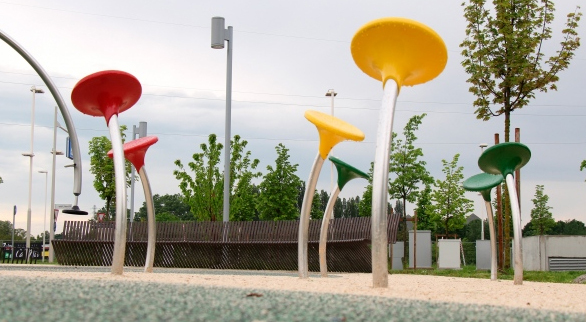 Finferlo's structure is in steel curved tubular and its seat is in cast aluminum coated with thermosetting powders for outdoor use. It is available in yellow, red and RAL colours. Dim. (LxWxH) 28x26,50x71cm, weight 10kg. Sitting on Finferlo is very easy and no effort is required. 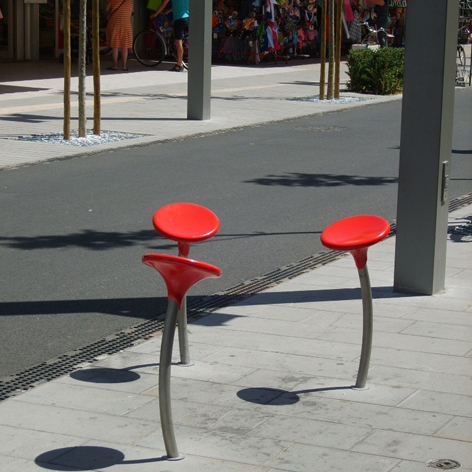 Its height is greater than common chairs or benches, so it helps people to sitting and standing up more easily. Its small size is however enough to ensure comfort and facilitates its positioning everywhere even in tight spaces. Finferlo is an ideal solution for having a rest and relieving tension in our back. Thanks to its height and inclination, the person sits and keeps his pelvis in the correct position. 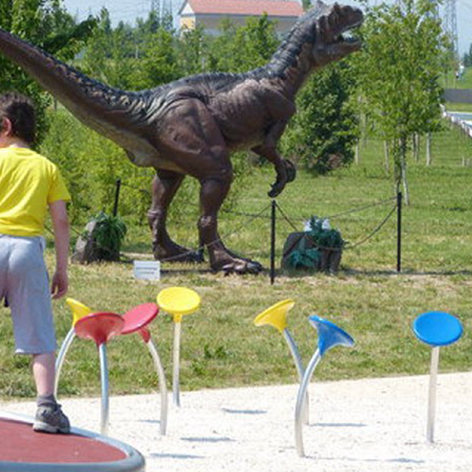 Finferlo favors the pelvis anteversion, the prompt alignment of the vertebral column, the body weight distribution on the ischial tuberosities and on the lower limbs, avoiding the excessive flexion of the hips. All these advantages are a value for the aged people, who sit up and get up without effort. Which advantages has Finferlo compared to other products? 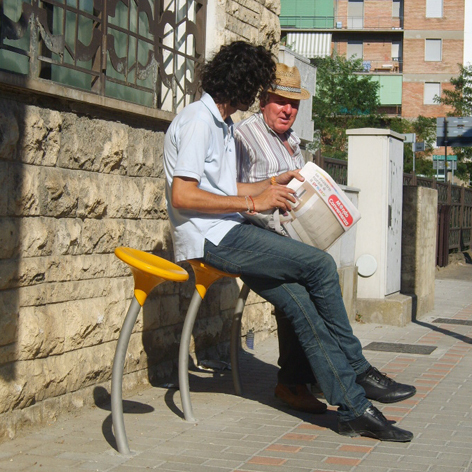 Finferlo offers much more advantages than other chairs or benches. ERGONOMY: Finferlo releases the tensions of the body and reduces the consequent postural pains for a long sitting. It is helpful for aged people. 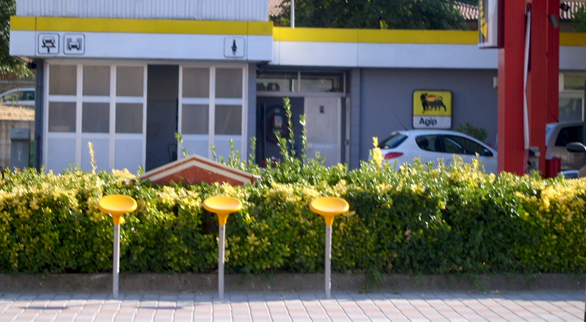 SMALL SIZE: Finferlo is an essential and thin seat. Its width in only 30 cm. so it is easier to placed it everywhere, also in small area. Aged people, pregnant women, people suffering from asthenia and with heart problems, they all need frequent stops! 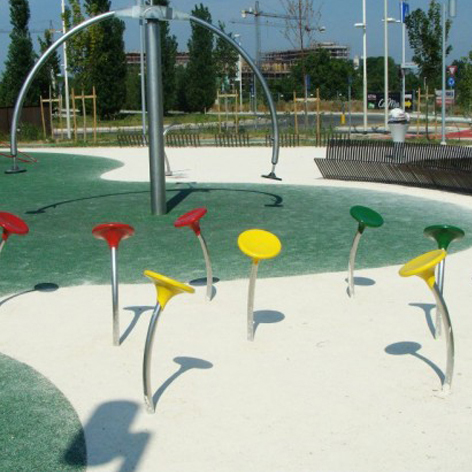 Finferlo is an attracting and decorative seat, which can easily be placed in squares, green areas, bus stops, in single file as well as in groups. ON STEEP PATHS : Steep paths need seats for answering to the needs of a large range of people such as aged, obese, cardiopathic people, pregnant women. This is why the archt. Mitzi Bollani designed Finferlo! It is the best solution especially in those cases. 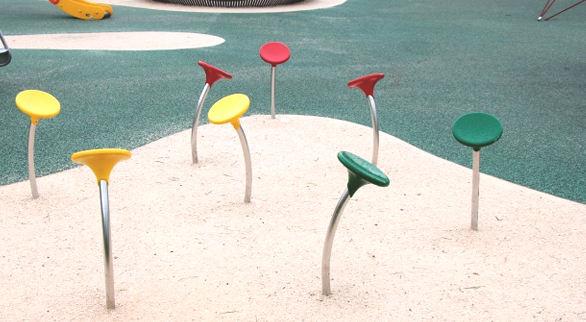 PLAYFULNESS: thanks to its thin shape, size and brilliant colours Finferlo is a playful seat which attracts children. Placed in single line, by using different colours, Finferlo can indicate different directions facilitating people orientation. 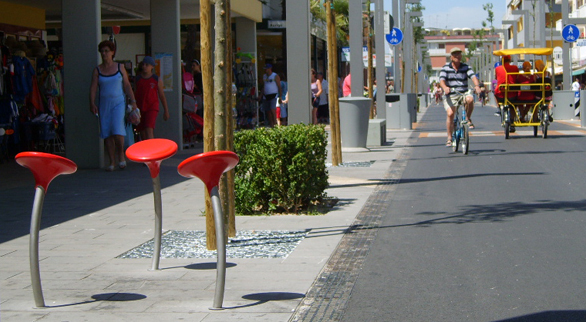 BICYCLE STOP: Finferlo can be use to tie a bicycle. Where can Finferlo be placed? 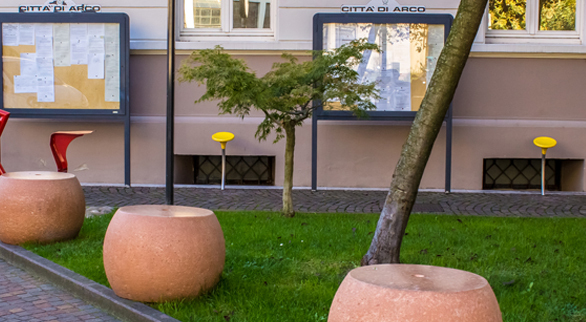 PARKS AND PUBLIC GARDENS, SQUARES AND URBAN ROUTES: Finferlo can be placed everywhere, in single line or in groups. Finferlo takes up small area. It decorates the environments, offers an ergonomic sitting to everyone, helps people in their orientations and is playful and attractive. It is posionable in naturalistic or landscape observation points. SHOPPING CENTERS, AIRPORTS, RAILWAY PLATFORMS ...: Highly crowded places are not easy for aged, obese people, pregnant women,...Often they have very long paths without any sitting possibility. 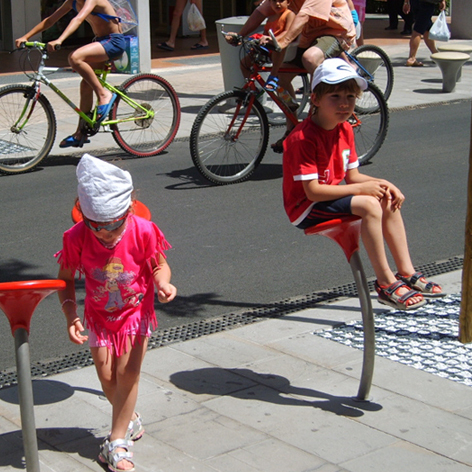 Finferlo is a functional and "fun" seat helpful in bus stops, corridors and waiting areas of airports and shopping centers: it takes up a minimum amount of space.